This post is sponsored by Smirnoff Sorbet Light. Thank you for supporting cool companies like Smirnoff who make it possible for me to keep creating fun new content for you to enjoy. All photos, opinions, ideas, and styling are (of course!) my own. I love to entertain in the summer. From casual brunches with friends to last-minute picnic dinners in the park, I'll use any excuse to gather a few of my nearest and dearest for a little summer fun. Though I'm generally prone towards excess, when it comes to summer parties, even I can admit that simple is better. Hot days are NOT meant to be spent in front of an oven, and the weather usually turns people into lighter eaters. My solution? Pick one or two things and make a whole party around it! 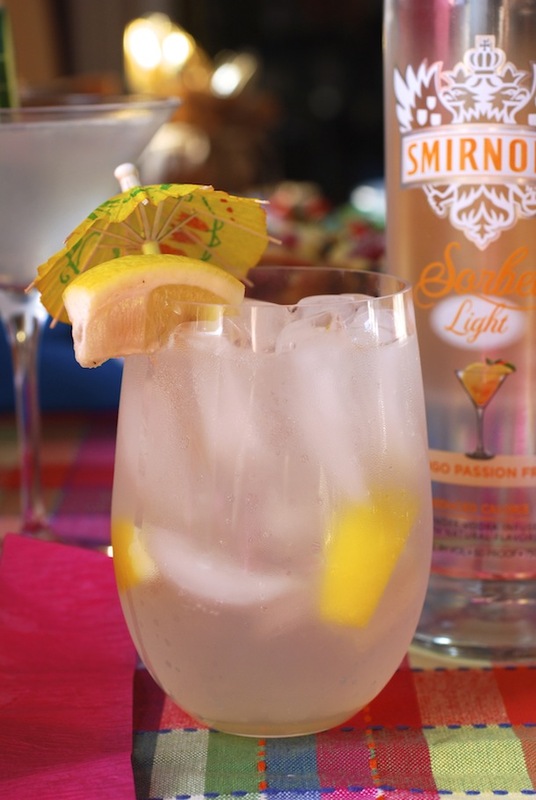 That's what I had in mind when I planned my Summer Sips & Sweets Social featuring Smirnoff Sorbet Light. 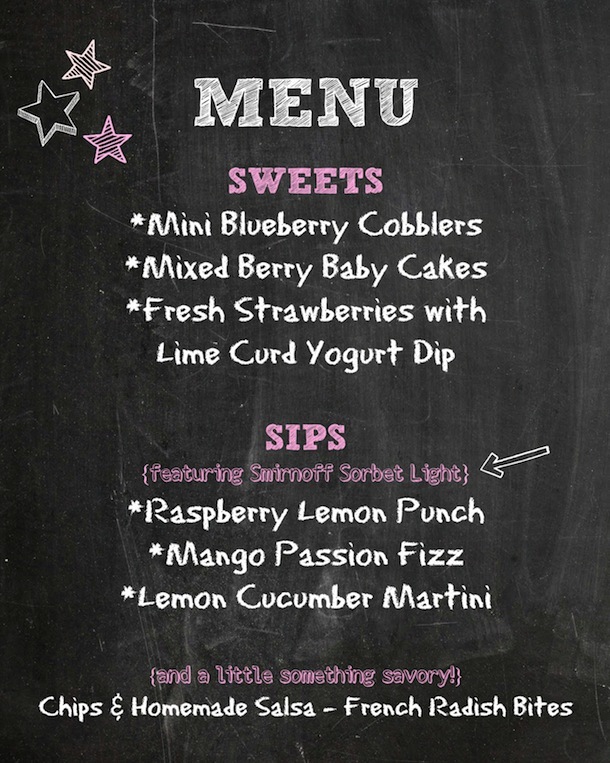 Sips & Sweets is my updated twist on the classic "punch and pie tradition," that is both easy to plan and easy on the wallet since you don't have to serve a full meal, and can limit the drinks to just a couple signature cocktails. (An added bonus during this season of vacations, weddings, and catalogs filled with cute summer dresses!). Berries are gorgeously in season right now, so I used them as the inspiration for my party menu. I made all the desserts in cute individually-sized portions, so that everyone could try one of each without hesitation. First on the menu? These freshly baked Mini Blueberry Cobblers, which I topped off with a sugary lemon biscuit crust and served still hot for maximum deliciousness. 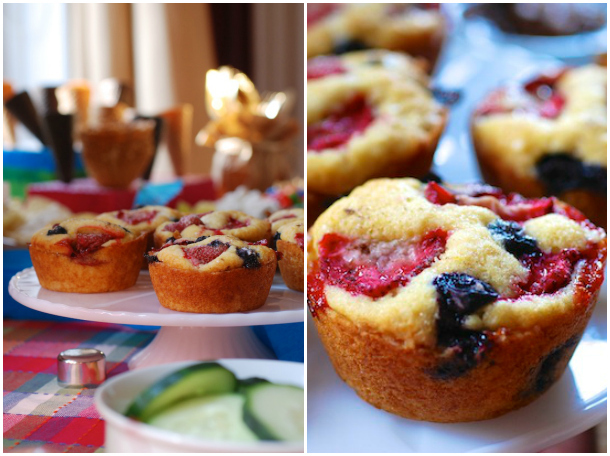 I also made little Mixed Berry Baby Cakes--little mini cakes studded with fresh strawberries and blueberries in a delicate batter. There is only a 1/3 cup sugar in this entire recipe, so the cakes aren't too sweet, but the perfectly ripe berries add a lovely burst of sweetness with each bite. One of my favorite recipes of the day was this tangy and creamy Lime Curd Yogurt Dip, which I served alongside a bowl of ripe strawberries. The ridiculously easy dip (literally just lime curd whisked with Greek yogurt!) is absolutely luscious, but healthy enough to even eat on its own for breakfast. 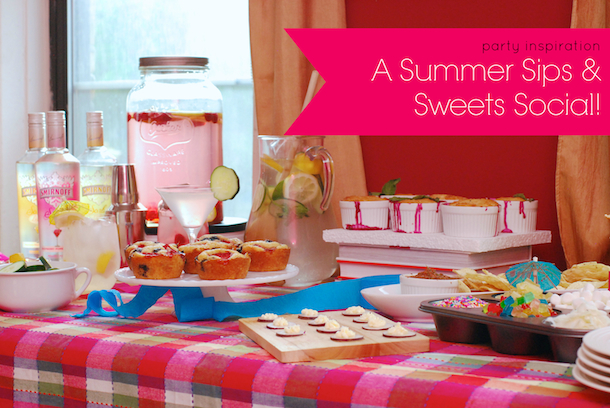 I paired these sweets with three cocktails featuring new Smirnoff Sorbet Light vodkas. These light, infused vodkas have only 78 calories per 1.5 oz, which means you can relax and enjoy a couple without having to worry about drinking all your calories for the day. And it doesn't hurt that these actually taste incredible! 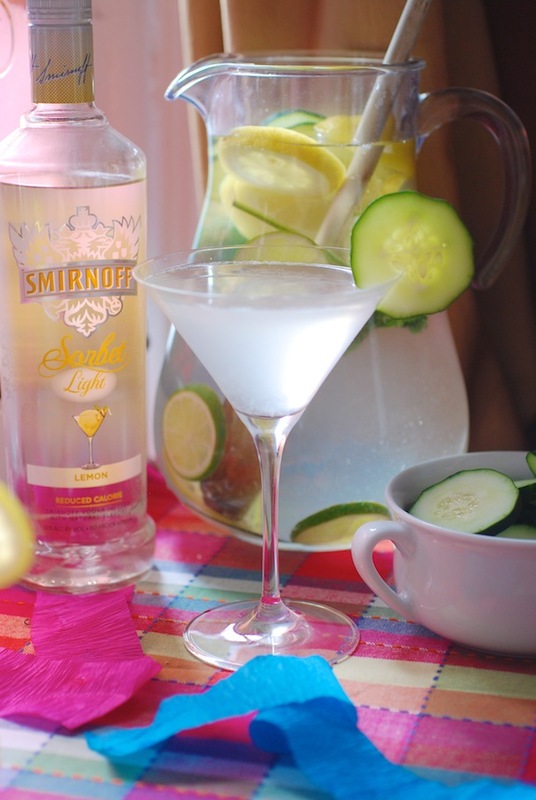 The first cocktail on my menu was a crisp Lemon Cucumber Martini made with Smirnoff Sorbet Light Lemon and garnished with fresh cucumber slices. I usually can't handle martinis (way too strong for me! ), but this cocktail was light, fresh and really refreshing for a hot summer afternoon. I loved the tiny little shards of ice that melted in my mouth with each sip. 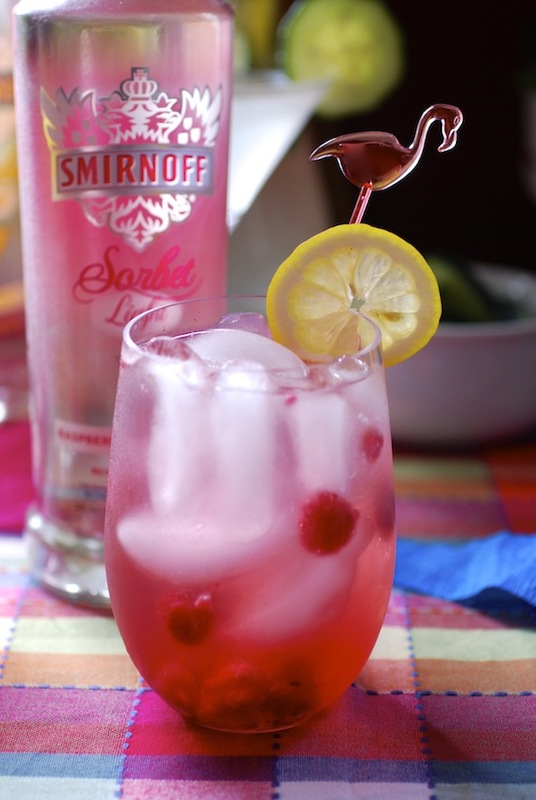 My favorite of the three vodkas is definitely the Smirnoff Sorbet Light Raspberry Pomegranate, which has the most fragrant berry aroma. I mixed this one into a Raspberry Lemon Punch Cocktail made with tart fresh lemonade and muddled ripe raspberries. I made a big batch of this one and served it in my favorite mason jar beverage dispenser, with plenty of ice and glasses for people to pour themselves a glass (or two!). I loved how pretty the pink punch looked in the sunlight. 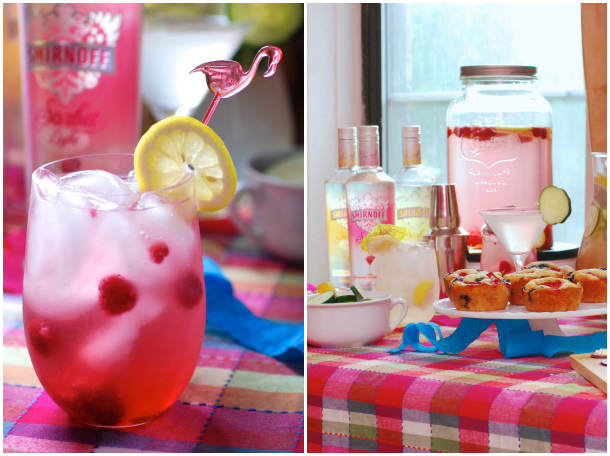 This would also be lovely to serve at a bridal shower or outdoor wedding. My favorite of the three cocktails was this Mango Passion Fizz, made with fresh lemon juice, club soda, a bit of simple syrup and Smirnoff Sorbet Light Mango Passion Fruit Vodka. It's refreshing, and the infused passion fruit and mango flavors really do come through, which was a huge (and very pleasant!) surprise. Along with the vodkas, I put out several bowls of fun summer cocktail garnishes like maraschino cherries, cucumber slices, and fresh lemon wedges for guests to dress up their drinks. Whenever I host friends over for cocktails, I make sure to also serve a big pitcher of chilled citrus-infused water to keep everyone refreshed (and to provide a delicious option for those who aren't drinking). Though my party was technically a "Sweets & Sips" party, I always think it's a good idea to include one or two healthy savory snacks to balance everything out. For this party, I served a batch of my spicy Homemade Restaurant-Style Salsa along with fresh veggies and tortilla chips. I also put out a small platter of French Radish Bites--one of my favorite (and so easy!) summer snacks. Just thin slices of radish topped with a bit of soft pastured butter and a sprinkle of flaky salt.